-Fixed a bug where players might see the generic end game epilogue instead of those specific to their form, such as with some succubus and harpy epilogues. - Added an autosave feature. By default the game is autosaved every 3rd morning, but the frequency can be set (or turned off altogether) when setting up a new game. Version 0.1.12.1 is released. This fixes a bug where the Bull By the Horns encounter repeats. Patreon backers can find the Debug version of the game from Patreon. Join the guest Discord channel here. Version 0.1.12.0 public is now out as of November 26, 2018. Scroll down to see the changelog. This game is a downloaded Windows executable for 64 and 32 bit operating systems (Windows 7 and newer). Exile of Aphrodisia is an adult transformation-themed game inspired by the Oregon Trail and the Odyssey. Your task is to lead a party of humans across the fantasy continent of Aphrodisia, pursued by demons who seek to enslave the remnants of humanity. The game is largely revolved around the concept of transformation of many sorts, including TG (transgender), anthro, animal, bizarre body modifications, inanimate, and more. As a new species to the continent, humans are prime targets for transformations from forces of nature and other sentient races, as well as the gods and goddesses who watch over the lands, imposing their will and (often unjust) sense of justice. As an elf hired to guide the party, it is your job to keep as many of the humans safe as you can to guide them to the dimensional rift in Niu Heym, the City of the Gate where humanity first arrived a thousand years ago. You must keep your party healthy and happy, and keep their lust under control to stop them from surrendering their freedom to the demons. - The highest unafflicted soldier and farmers in the party can result in bonus food gains (or penalties) from some scavenging results. - Successfully guiding your party to the gate now also displays epilogues for your player character. 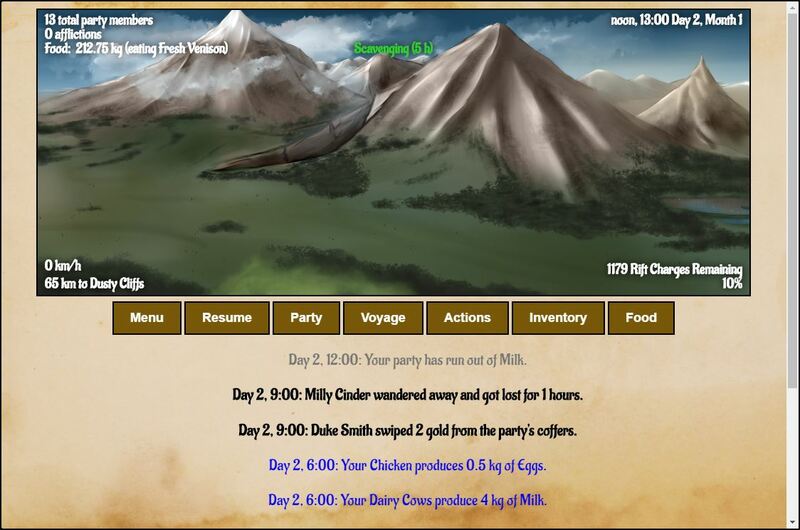 - Added choice when beginning a new game to select a party preset. Party presets have consistent characters with consistent professions, skills, appearances, and backstories, and may present some unique challenges in the future. There is currently one preset, The Daughters of Golorith, a fairly well balanced group of all women. - You can now alter a party member's skill for their first profession on the New Game page. The sum of profession skills will always be balanced to be 35 in total. - You can now add an extra or remove individual members on the party selection page. 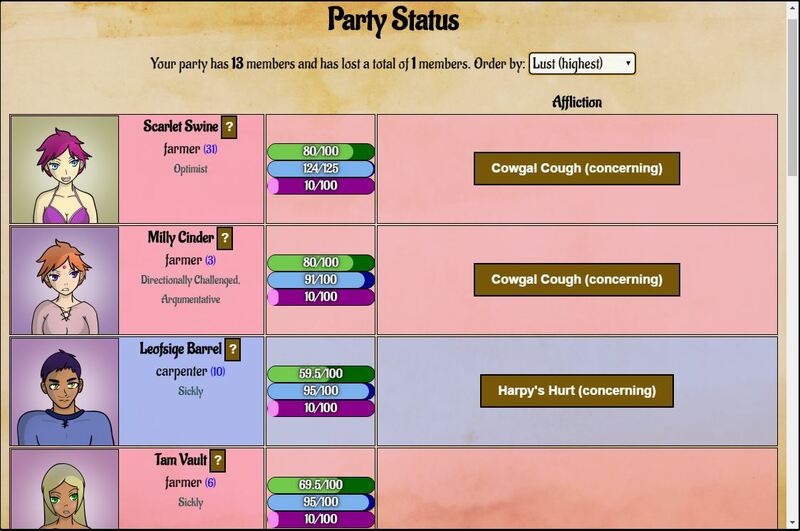 - You can now choose to add or remove individual traits for party members on the new game creation page. Upon assigning a trait, the other traits that are exclusive to it will dissappear. For example, if you make someone 'chaste' then the option to make them a 'nymphomaniac' will no longer show. - You can now write your own backstories for characters on the new game creation page. - You can now save your own party setup as your own preset. New party presets will appear in the preset/party folder and will appear on the party preset dropdown. - New biome, the Ice Roads. The artwork for this landscape is by Balile. As with the desert, the ice roads will come with its own set of encounters and challenges. - Added Liters of Water and Bundles of Firewood which are consumed in the desert and ice roads biomes, respectively, at a rate of 1 unit per party member (included afflicted ones.) These resources can be bought in stores or found via scavenging events. Failure to have enough resources will harm party members' health and morale. Be sure to stock up on these in landmarks early on. - The trail is now slightly less randomand will always have the ice roads and desert stretches be grouped together. - Reformatted layout of landmarks page to allow for graphics being worked on. The graphic is a placeholder while the artist works on the graphic. - Added 16 scavenging results for the new ice roads biome by both myself and Duhad. - The party's best artisan now turns Spools of Linen into linen outfits of varying quality based on their skill level. Doing so requires Spools of Linen in the inventory. - It's now possible to replace a party member's affliction treatment from a weaker potion to a stronger potion. For example, a potion can replace a minor potion and a major potion can replace a potion. Effects do not stack. - Added tutorial messages on certain pages (encounter, affliction, affliction detail, inventory, store) that explain some of the game mechanics in more detail for new players. - "Legend of the Lover"
With the AR themed notably added, will this game have age regression down to a toddler or that of a baby? Even if it results soon-after to a game over and whatnot, I know a dozen sites that are into Age regression themes that would love to support this :P!!! Future Edit 12/5/18: And now after trying this game, I can safely declare this a GREAT game! The transformations arewell done and fun to discover (out to add a gallery or something to see all transformations and possible endings), and i really love the artwork! This is seriously worthy of being on Corruption Of Champion's rival, with all the fun game mechanics and whatnot. I never played Oregon Trail but i know of it's legendary difficulty, and this game is no exception. I'll be rooting and trying to finish that awesome quest and eventually win the game, but overall this game is a must for everyone who loves both text base games and monster-transformation games!!! I agree with danime91, it's a cool little game and it would make it even cooler if afflicted party members stay partially afflicted even after getting cured. Your Downloads are broken or something. I follow the link and go to download then select the version i wish to download and I just get a malware warning screen for w3g3a5v6.ssl.hwcdn.net. I click view this sight anyways and I get a blank page with a yahoo search bar embedded at http://search.dnsadvantage.com/main?. So I can't even play it. It might be something on my end though. I'm not sure.